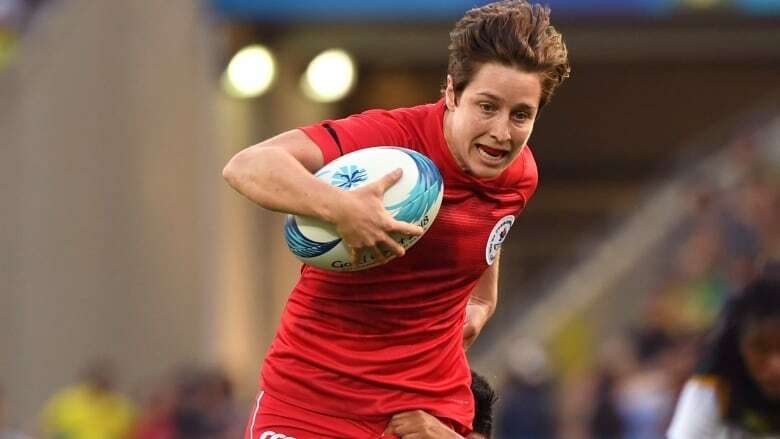 Following a "disappointing" loss to New Zealand, the Canadian women's rugby sevens team have drawn the hosts in the semifinals at the Commonwealth Games in the Gold Coast. GOLD COAST, Australia — This was the match the Canadian women's rugby sevens team were waiting for. The team had broken their opponent's shutout streak and were ahead on the scoreboard by the end of the first half. The second half was another game entirely. New Zealand rallied from a 7-5 deficit by capitalizing on some key Canadian turnovers, and won the match 24-7 on the strength of a pair of tries from 2017 World Sevens player of the year Michaela Blyde. "[It's] a little disappointing," Canadian captain Ghislaine Landry said. "We've been prepping for that game and we know what we need to do on the field but that obviously wasn't the plan. "We'll go back and look at it but we really just have to get our minds ready for tomorrow." After beginning their Gold Coast quest with wins over South Africa and Kenya, the final match of pool play offered Canada the chance to win their group and avoid the world No. 1-ranked Australians in the semifinals. Canadian coach John Tait says his team's lack of composure in the second half was the difference in the result. "We shot ourselves in the foot with a few unforced errors [and] a couple turnovers," Tait said. "We just have to show more composure against New Zealand. They live off of turnovers and they score off of them all the time and they did that to us in the second half. "We'll take a lot from that — it's better to learn that lesson today than tomorrow." Both the Canadians and Kiwis came into the match undefeated in Pool A play, but the Black Ferns had two dominant, shutout victories to their credit — 45-0 against Kenya and 41-0 over South Africa. Simply scoring on New Zealand — the try was scored by Julia Greenshields — was not enough for Landry. "To be honest, that's not what we are thinking about, we're thinking about winning, we're not looking to break any record or points against them," she said. "It's a game of possession and we didn't keep it enough." It may not be the last the Canadians have seen of the Kiwis (3-0), who will move on to face England, the second-place team from Group A. To get there, the Canadians will have to beat the top-ranked Australians on their own turf (Saturday night at 8:59 p.m. ET in Canada), in front of a very vocal home crowd on the final day of competition at Robina Stadium, and the Gold Coast Games. The winner of that fixture moves on to play for the very first Commonwealth Games gold medal in women's sevens. Despite the intensity on the pitch during the Canadian-New Zealand clash, the atmosphere in the crowd was a festive one, with fans joyfully singing and dancing along to Taylor Swift and Journey, doing the wave, and bopping oversized beach balls through the stands. That laissez-faire attitude tends to disappear once the home squad takes the field with fans creating a deafening roar. "We've faced Australia in Sydney the last couple of years [and] it gets the adrenaline going and gives you a lot of energy," Tait says. "We just need to make sure we channel it in the right direction." Landry says despite the activity off the pitch, they'll be focused and ready for tomorrow's crucial match. "They'll obviously be loud — the fans have been great for every game, to be honest, you would think it's a home game every time," she says. "It's nice to get an upset on a home crowd, but that's not what we're thinking about, we're going to perform our game and good things should happen." Australia won their pool by picking up wins over Wales (34-5), England (29-12), and Fiji (17-10) although it took a late try by Charlotte Caslick on a man-advantage to capture that final win. Tait says for his team to win, possession is key. "It'll be important for us just to keep the ball and build some phases of pressure," he says. "The longer you have the ball in sevens, the higher probability that your going to score. We can't look to hit home runs right away. "We have to take the opportunities as they come and be patient." Landry's message to her teammates is simple: tomorrow is a new day. "The great things about sevens is that you turn around and do it all over again," she said. "The next two games are gonna be just as tough. "We just got to get our heads right, rest the bodies, and come back stronger."